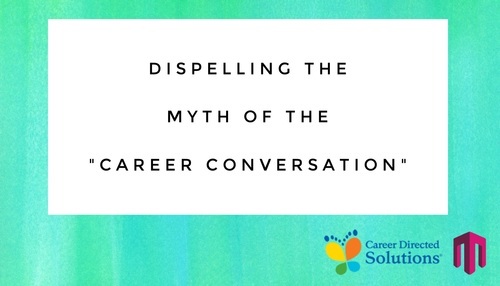 Dispelling the Myth of "Career Conversations"
Tuesday 10th October, Tuesday 17th October and Tuesday 31st October. In partnership with Career Directed Solutions we have built a series of three, ninety minute sessions based around ‘Career Conversations’. Each session will provide participants with the latest data/trends, facilitated discussions using career conversation tools and techniques that can be taken back into their organisations supported by a coaching model. The sessions are built around the three layers of career management conversations – the organisation, across teams/generations and with yourself. The sessions can be attended as a series or on a stand-alone basis. ​​About Career Directed Solutions (CDS) is a niche HR consulting firm, who take a fresh approach to helping their customers protect their reputation and employer brand by providing high quality, personal support to customers during times of organisational change. Their focus is on delivering great coaching, outplacement, career and change management support. Helping people take ownership of their careers to achieve their full potential, whether that's supporting an internal move, promotion, role/personal development, or helping people develop the skills they need to manage their next career move. Click the following links for more information on the speakers. Or call us on 01159 470 200 to find out more about these events.